We have so many devices in our house from game consoles to iPhones to an iPad to a Kindle Fire. We are a very techy family as I truly believe that everyone can learn a lot more from technological advances. With the increase in technology comes more electronics and more portability along with more usage from children. These devices cost so much that you want to ensure there is adequate protection from the accidental drops, the frustrated mistreatment and the fighting over whos turn it is. OtterBox is protecting my iPhone and iPad and to date, it hasn't failed me. I chose OtterBox due to their reputation and the number of devices they cover. I have the Defender Series case that fits our 2nd generation iPad. It has multi-layer technology built in with high-quality materials to create a rock-solid protective solution. The rugged silicone outer-layer absorbs the impact from bumps and shocks while the textured exterior provides enhanced grip. The built-in screen protector prevents scratches, smudges and fingerprints from getting on your screen. I really like the shield stand as it not only acts as a protective cover on the front or the back but it doubles as a stand for typing or viewing. For my iPhone, I have the Defender Series case that fits the 4S and has three layers of protection against drops, bumps and shocks. This is great because I don't carry a purse and I'm more prone to drop it. The built in screen protector prevents scratches and smudges which is great for my children. What is also nice about OtterBox is the ability to choose from a variety of styles and colors. There are also other series pending your lifestyle and need for protection. 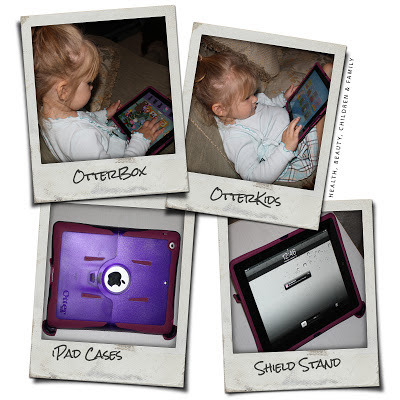 OtterBox is really a great place to purchase the extra protection for your smart phones and devices. I like the ease of use, the availability of colors and styles along with the fact that I can find them easily for purchase. They may cost a bit more but it's worth having the protection of not having to purchase a replacement device if dropped or mistreated. We are definitely an OtterBox family and recommend them. *Disclosure: I received a case for the value up to $60 for this review. I had purchased an iPhone case prior to this review. All opinions are of my own.